18 year-old Thomas Frongillo from Oxford, England, has been arrested and charged with "threatening to commit a crime and threatening a bombing or hijacking" after being accused of leaving hostile messages in an online game run by Jagex, the publishers of Runescape. 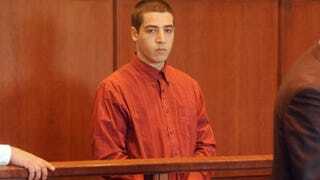 While the game in question is not disclosed in a report on The Worcester Telegram and Gazette, Frongillo - a student at a local police academy - is alleged to have typed "I'm shooting up my school tomorrow”, and also of having made anti-Semitic comments. The comments in question were first picked up by Jagex employees last week, and quickly forwarded to local police. Fongillo's lawyer says the comments were meant as a "harmless jest".